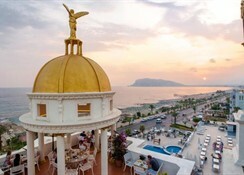 The Antique Roman Palace Hotel is a distinctive 4-star boutique hotel located close to Alanya town, on the south-west Antalyan coast of Turkey. Offering an All Inclusive package, this 110-room hotel, with private beach, provides good value for money accommodation to couples and families. 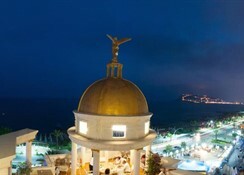 The Antique Roman Palace Hotel has pools for adults & children, a Kid's Club, fitness & Spa facilities, hosted entertainment, and a lovely beach with water sports and fun activities available. 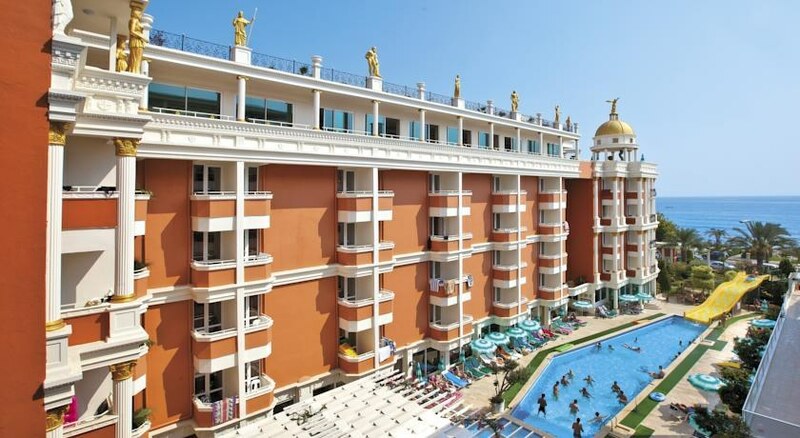 To enjoy great Turkish hospitality, and a terrific warm climate, book into the Antique Roman Palace Hotel and relax and unwind. 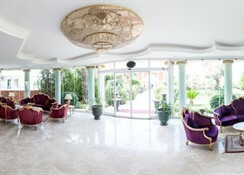 Getting to the hotel: It is 135km to Antalya International Airport (AYT) from the Antique Roman Palace hotel. Local tips: The hotel is only 1km from the nearest shopping centre, and only 2km from the town centre. There is plenty of history & culture to be explored in the surrounding area. 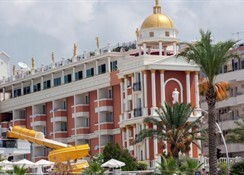 Food, drink and entertainment in the Antique Roman Palace hotel: Ottoman restaurant provides Turkish and international cuisine, beach bar, pool bar, and terrace bar for socialising, sitting & TV rooms, reading hall, and hosted entertainment shows. Sport, games and activities: Swimming pool with sun terrace, sun beds & parasols, fitness centre, Turkish bath, sauna, table tennis, mini golf, darts, games room, and access to external private beach water sports/fun. For the kids: Children's pool, water slides, Kid's Club, and playground. 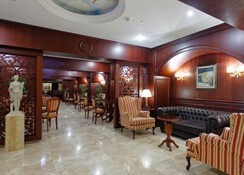 Additional: Reception Services, housekeeping, tourism advice, conference hall, and meeting room. Guest rooms in the Antique Roman Palace hotel are bright and modern with a Mediterranean decor, comfortable furnishings and amenities to provide for your well-being; features include a furnished balcony with sea view, air-conditioning, a private bathroom with bathtub, hair dryer & telephone, satellite TV with music channels, telephone, mini fridge, safe box, and carpeted floors.